Life Start®2 Designed with a gentle goat's milk formula specifically for those whose stomachs are sensitive to cow's milk. Can be used at any age; babies, children, adults and seniors. Contains Bifidobacterium infantis, NLS super strain, minimum 2 billion cfu in each serving. Select: Available in capsules and powder. Select the size. Life Start 2® - the same bacteria found in Life Start®, Bifidobacterium infantis, but cultured in goat's milk to facilitate easy digestion. 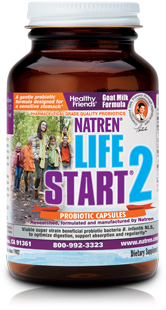 Life Start® probiotic formula is specifically designed and formulated for people of all ages with immune system hypersensitivity that leads to inflammatory conditions such as irritable bowel syndrome (IBS*).